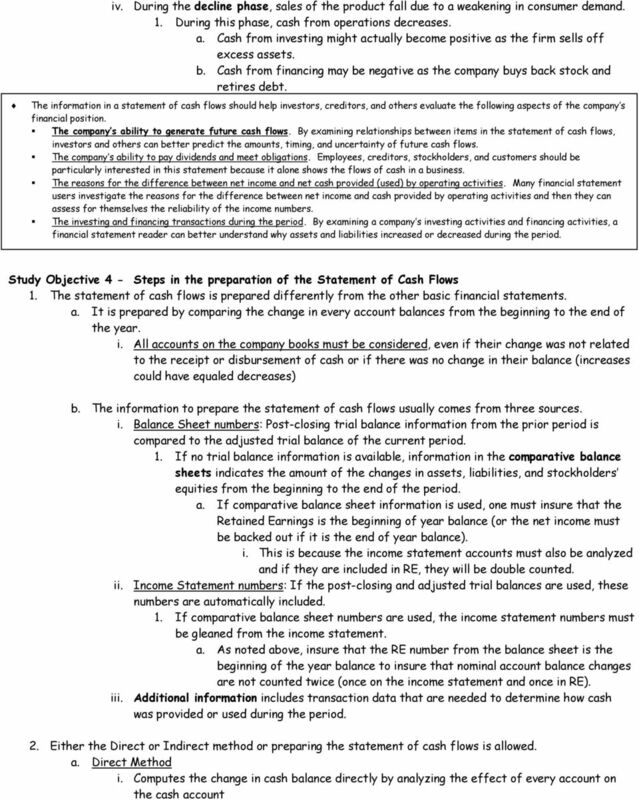 Download "Statement of Cash Flows. Study Objectives"
2 b. Activities involving cash are reported in a format that reconciles the beginning and ending cash balances. i. 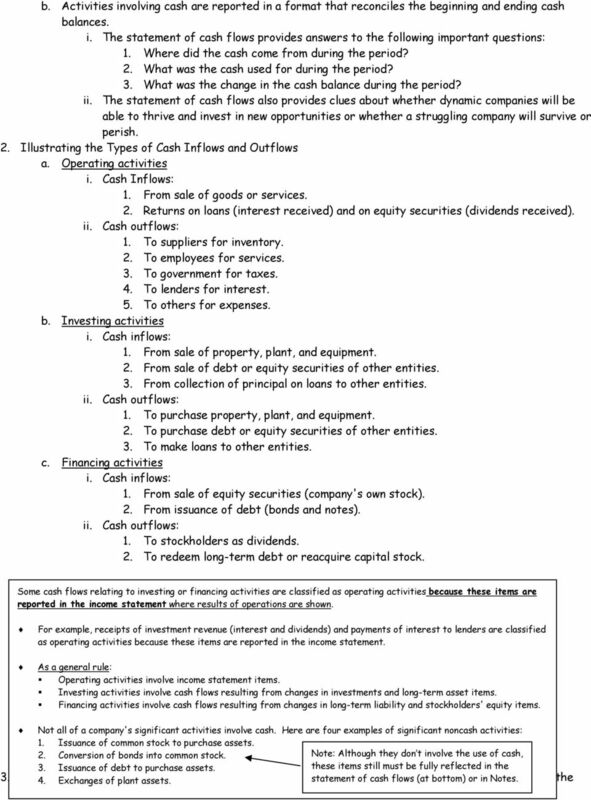 The statement of cash flows provides answers to the following important questions: 1. Where did the cash come from during the period? 2. What was the cash used for during the period? 3. What was the change in the cash balance during the period? ii. The statement of cash flows also provides clues about whether dynamic companies will be able to thrive and invest in new opportunities or whether a struggling company will survive or perish. 2. Illustrating the Types of Cash Inflows and Outflows a. Operating activities i. Cash Inflows: 1. From sale of goods or services. 2. Returns on loans (interest received) and on equity securities (dividends received). ii. Cash outflows: 1. To suppliers for inventory. 2. To employees for services. 3. To government for taxes. 4. To lenders for interest. 5. To others for expenses. b. Investing activities i. Cash inflows: 1. From sale of property, plant, and equipment. 2. From sale of debt or equity securities of other entities. 3. From collection of principal on loans to other entities. ii. Cash outflows: 1. To purchase property, plant, and equipment. 2. To purchase debt or equity securities of other entities. 3. To make loans to other entities. c. Financing activities i. Cash inflows: 1. From sale of equity securities (company's own stock). 2. From issuance of debt (bonds and notes). ii. Cash outflows: 1. To stockholders as dividends. 2. To redeem long-term debt or reacquire capital stock. Some cash flows relating to investing or financing activities are classified as operating activities because these items are reported in the income statement where results of operations are shown. For example, receipts of investment revenue (interest and dividends) and payments of interest to lenders are classified as operating activities because these items are reported in the income statement. As a general rule: Operating activities involve income statement items. Investing activities involve cash flows resulting from changes in investments and long-term asset items. Financing activities involve cash flows resulting from changes in long-term liability and stockholders' equity items. Not all of a company's significant activities involve cash. Here are four examples of significant noncash activities: 1. Issuance of common stock to purchase assets. 2. Conversion of bonds into common stock. Note: Although they don t involve the use of cash, 3. Issuance of debt to purchase assets. these items still must be fully reflected in the 3. Significant 4. Exchanges financing of plant and assets. investing activities that do not statement affect of cash cash are flows not (at reported bottom) or in the Notes. body of the statement of cash flows. 3 a. They are reported either in a separate schedule at the bottom of the statement of cash flows or in a separate note or supplementary schedule to the financial statements. b. The reporting of significant activities not affecting cash in a separate or supplementary schedule satisfies the full disclosure principle because it identifies significant non-cash investing and financing activities of the enterprise. c. The three activities--operating, investing, and financing--plus the significant noncash investing and financing activities make up the general format of the statement of cash flows, plus the significant noncash investing and financing activities. 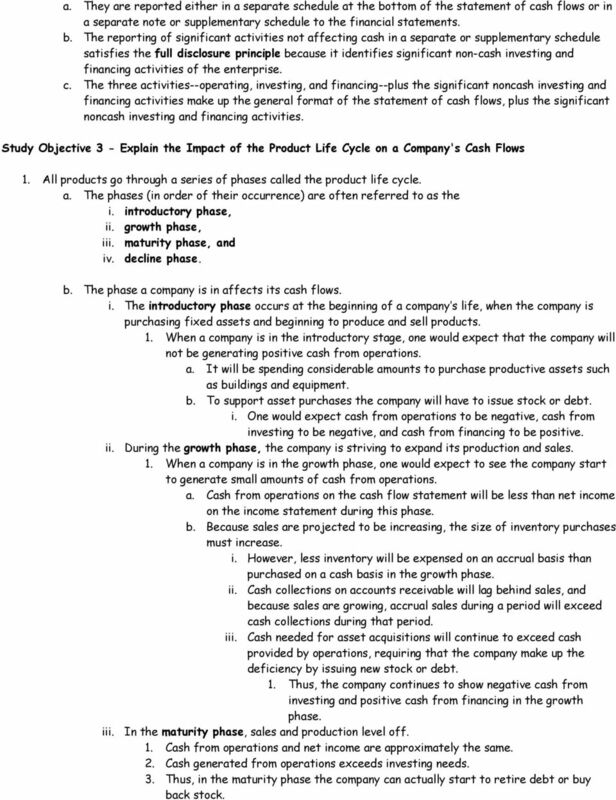 Study Objective 3 - Explain the Impact of the Product Life Cycle on a Company's Cash Flows 1. All products go through a series of phases called the product life cycle. a. The phases (in order of their occurrence) are often referred to as the i. introductory phase, ii. growth phase, iii. maturity phase, and iv. decline phase. b. The phase a company is in affects its cash flows. i. The introductory phase occurs at the beginning of a company s life, when the company is purchasing fixed assets and beginning to produce and sell products. 1. When a company is in the introductory stage, one would expect that the company will not be generating positive cash from operations. a. It will be spending considerable amounts to purchase productive assets such as buildings and equipment. b. To support asset purchases the company will have to issue stock or debt. i. One would expect cash from operations to be negative, cash from investing to be negative, and cash from financing to be positive. ii. During the growth phase, the company is striving to expand its production and sales. 1. When a company is in the growth phase, one would expect to see the company start to generate small amounts of cash from operations. a. Cash from operations on the cash flow statement will be less than net income on the income statement during this phase. b. Because sales are projected to be increasing, the size of inventory purchases must increase. i. However, less inventory will be expensed on an accrual basis than purchased on a cash basis in the growth phase. ii. Cash collections on accounts receivable will lag behind sales, and because sales are growing, accrual sales during a period will exceed cash collections during that period. iii. Cash needed for asset acquisitions will continue to exceed cash provided by operations, requiring that the company make up the deficiency by issuing new stock or debt. 1. Thus, the company continues to show negative cash from investing and positive cash from financing in the growth phase. iii. In the maturity phase, sales and production level off. 1. Cash from operations and net income are approximately the same. 2. Cash generated from operations exceeds investing needs. 3. Thus, in the maturity phase the company can actually start to retire debt or buy back stock. 5 1. The FASB has expressed a preference for the direct method but allows the use of either method 2. The direct method is more consistent with the objective of the statement of cash flows because it shows operating cash receipts and payments. b. Indirect Method i. Computes the change in cash by starting with net income and then reconciling net income for the period to the change cash balance by adjusting from accrual accounting (revenue recognized when earned, expenses recognized when incurred) to cash basis accounting (revenue recognized when cash received, expenses recognized when cash paid). 1. in The indirect method is used extensively in practice. Companies favor the indirect method for three reasons: a. Accountants claim it is easier to prepare that is a red herring. i. It is definitely more difficult for non-accountants to understand 1. Just consider the difficulty you have as students in converting from accrual to cash basis. b. It focuses on the differences between net income and net cash flow from operating activities. c. It tends to reveal less company information to competitors. The last statement says it all it tends to reveal less information to competitors. The point of financial statements is to enable investors and creditors to invest scarce cash in the most productive activity. It seems ludicrous that a method that intentionally obfuscates valuable information is allowed in this day of mass corporate and accounting industry fraud but it is. Go Figure! c. Differences between the direct and indirect methods: i. They differ in disclosing the items that make up the total amount of operating activities. ii. The investing activities and financing activities sections are not affected by the choice of method. 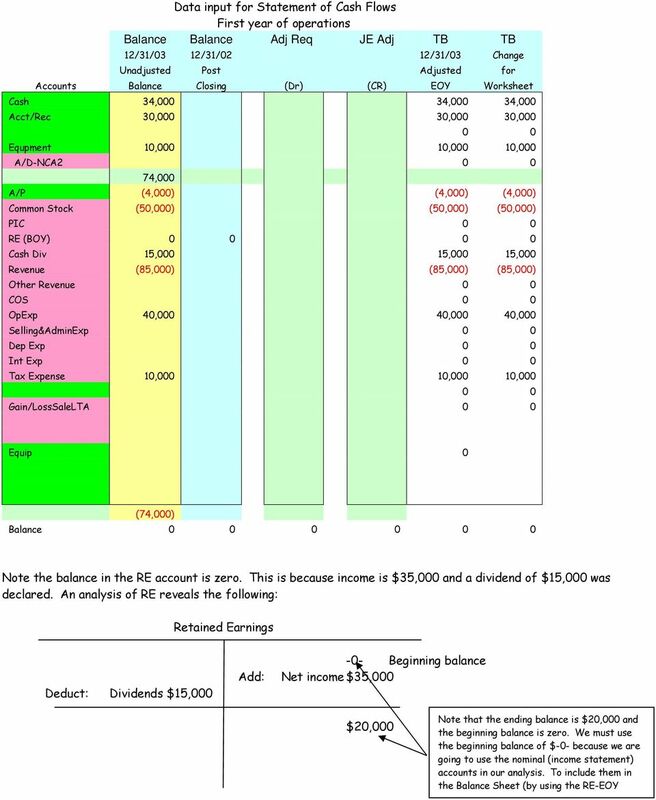 Study Objective 5a - Prepare a Statement of Cash Flows Using the Indirect Method Computer services Company started in January 1, 2003, when it issued 50,000 shares of $1 par value common stock for $50,000 cash. The company rented its office space and furniture and performed consulting services throughout the first year. The comparative balance sheet for the beginning and end of 2003, showing increases or decreases appears as follows: COMPUTER SERVICES COMPANY Comparative Balance Sheet Assets Dec. 31, 2003 Jan 1, 2003 Increase/Decrease Cash $ 34,000 $ -0- $ 34,000 increase A/R 30, ,000 increase Equipment 10, ,000 increase Total $ 74,000 $ -0- Liabilities and stockholders' equity A/P $ 4,000 $ -0- $ 4,000 increase CS 50, ,000 increase RE 20, ,000 increase Total $ 74,000 $ -0- COMPUTER SERVICES COMPANY Income Statement For the Year Ended December 31, 2003 Revenues $85,000 Operating expenses 40,000 Income before income taxes 45,000 Income tax expense 10,000 Net income $35,000 Note that RE is not dated in the Balance Sheet; This means that you must determine if it is the Beginning (BOY) or ending (EOY) balance to insure the income numbers are not counted twice. Additional Information: (a) Examination of selected data indicates that a dividend of $15,000 was declared and paid during the year. (b) The equipment was purchased at the end of No depreciation was taken in 2003. 7 Statement of Cash Flows Statement of Cash Flows Cash Acct/Rec Equipment A/P Common Stock RE (BOY) Cash Div Revenue OpExp Tax Expense Total Computer Services For Year Ended 12/31/03 34,000 30,000 10,000 (4,000) (50,000) 0 15,000 (85,000) 40,000 10,000 0 Operating Activities: 0 Accounts Recievable (30,000) 30,000 (30,000) Cash Collections: (30,000) 0 Revenue 85,000 (85,000) 85,000 0 OpExp (40,000) 40,000 (40,000) 0 NI Tax Expense (10,000) 10,000 (10,000) 0 A/P 4,000 (4,000) 4,000 0 Net Cash from Operations: 9,000 0 Investing Activities: 0 Changes in NCA 0 Equipment (10,000) 10,000 (10,000) 0 A/D-NCA2 0 Net Cash from Investing Activities (10,000) 0 0 Financing Activities: 0 Changes in Short/Long-Term Debt 0 Changes in Long-Term Debt Common Stock 50,000 (50,000) 50,000 0 PIC 0 RE (BOY) 0 Cash Div (15,000) 15,000 (15,000) 0 Net Cash from Financing Activities 35,000 0 Net Change in Cash 34,000 0 Add: Cash At BOY 0 0 Cash Balance At EOY 34, Procedure: 1. Taking into account every account in the trial balance, the accounts and the changes in balance are listed across the top two rows. 2. The Statement is to the left of the heavy line; the worksheet is to the right. 3. Every account in the trial balance must be accounted for with the change in balance listed under the cash column and a corresponding but opposite affect in the statement. 4. Note that every row and every column crossfoots or foots to zero. 5. The relationships are strictly mechanical; that is to say that the practitioner must only know and understand what type of effect (Operation, Investing or Financing) that a given change will create. 8 Book method of statement of cash flows (First year of operations): You decide which method works for you! Step 1 Determining the net increase or decrease in cash. As shown in the balance sheet above, Computer Services had no cash on hand at the beginning of 2003 and a balance of $34,000 at the end of the year. Therefore, the change in cash for 2003 was an increase of $34,000. Step 2 Determining net cash provided/used by operating activities. To determine net cash provided by operating activities under the indirect method, net income is adjusted for items that did not affect cash. Under generally accepted accounting principles most companies use the accrual basis of accounting, and under this method net income does not indicate the net cash provided by operating activities. Therefore, under the indirect method, net income must be adjusted to convert certain items to the cash basis. The indirect method adjusts net income for items that affected reported net income but did not affect cash. Noncash charges in the income statement are added back to net income. Likewise, noncash credits are deducted. The result is net cash provided by operating activities. Receivables, payables, prepayments, and inventories should be analyzed for their effects on cash. Increase in Accounts Receivable--When accounts receivable increase during the year, revenues on an accrual basis are higher than revenues on a cash basis. In other words, operations of the period led to revenues, but not all of these revenues resulted in an increase in cash. For example, Computer Services Company had revenues of $85,000 in its first year of operations. However, it collected only $55,000 in cash. 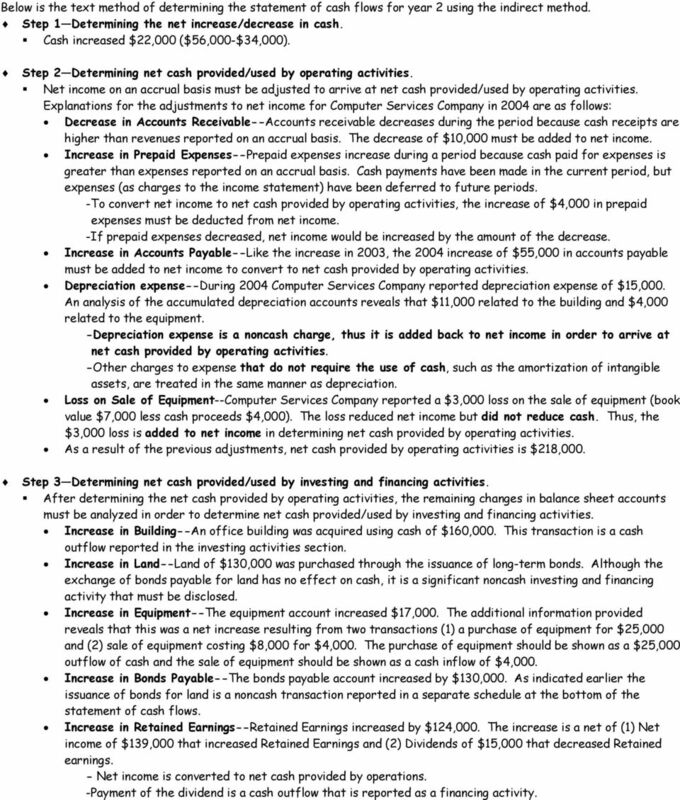 Although accrual basis revenue was $85,000, cash basis revenue would be only $55,000. Therefore the increase in accounts receivable of $30,000 must be deducted from net income. If accounts receivable decrease, the decrease must be added to net income. Increase in Accounts payable--when accounts payable increase during a year, operating expenses on an accrual basis are higher than they are on a cash basis. 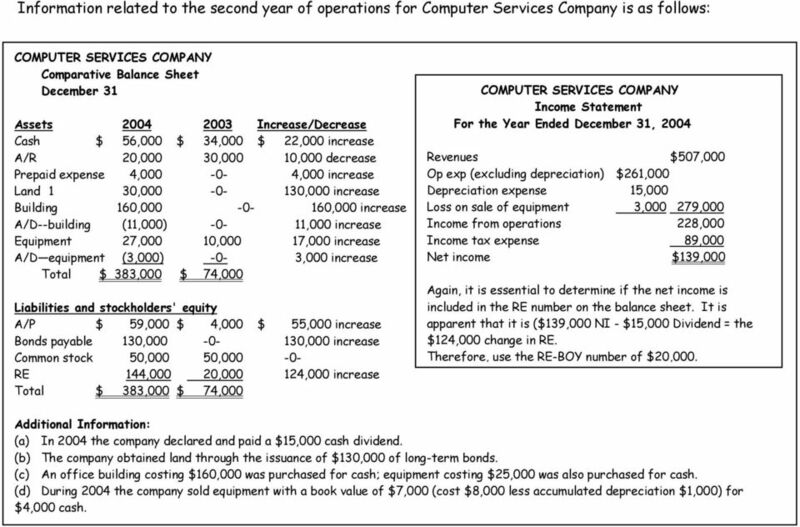 For Computer Services Company, operating expenses reported in the income statement were $40,000. However, since Accounts Payable increased $4,000, only $36,000 ($40,000 - $4,000) of the expenses was paid in cash. To convert net income to net cash provided by operating activities, an increase in accounts payable must be added to net income. Conversely, a decrease in accounts payable would have to be subtracted from net income. For Computer Services Company, the changes in accounts receivable and accounts payable were the only changes in current assets and current liability accounts. Therefore, any other revenues or expenses reported in the income statement were received or paid in cash, and no adjustment of net income is necessary. The operating activities section of the statement of cash flows for Computer Services Company would appear as follows: COMPUTER SERVICES COMPANY Partial Statement of Cash Flows--Indirect Method For the Year Ended December 31, 2003 Cash from operating activities Net income $ 35,000 Adjustments to reconcile net income to net cash provided by operating activities: Increase in accounts receivable $ (30,000) Increase in accounts payable 4,000 26,000) Net cash provided by operating activities $ 9,000 Step 3 Determining net cash provided/used by investing and financing activities. 9 Changes in each noncurrent account are analyzed using selected transaction data to determine the effect, if any, the changes had on cash. Computer Service Company's three noncurrent accounts are Equipment, Common Stock, and Retained Earnings, all three of which had increases during the year. No transaction data are given for the increases in Equipment of $10,000 and Common Stock of $50,000. When other explanations are lacking, we assume any differences involve cash. The increase in equipment is assumed to be a purchase of equipment for $10,000 cash. This purchase is reported as a cash outflow in the investing activities section. The increase of common stock is assumed to result from the issuance of common stock for $50,000 cash. It is reported as an inflow of cash in the financing activities section of the statement of cash flows. The reasons for the increase of $20,000 in the Retained Earnings account are determined by analysis. First, net income increased retained earnings by $35,000. Second, the additional information indicates that a cash dividend of $15,000 was declared and paid. The $35,000 increase due to net income is reported in the operating activities section. The cash dividend paid is reported in the financing activities section. The $20,000 increase in Retained Earnings in 2003 is a net change. Having completed the three steps, we can prepare the statement of cash flows by the indirect method. The statement starts with the operating activities section, followed by the investing activities section, and then the financing section. 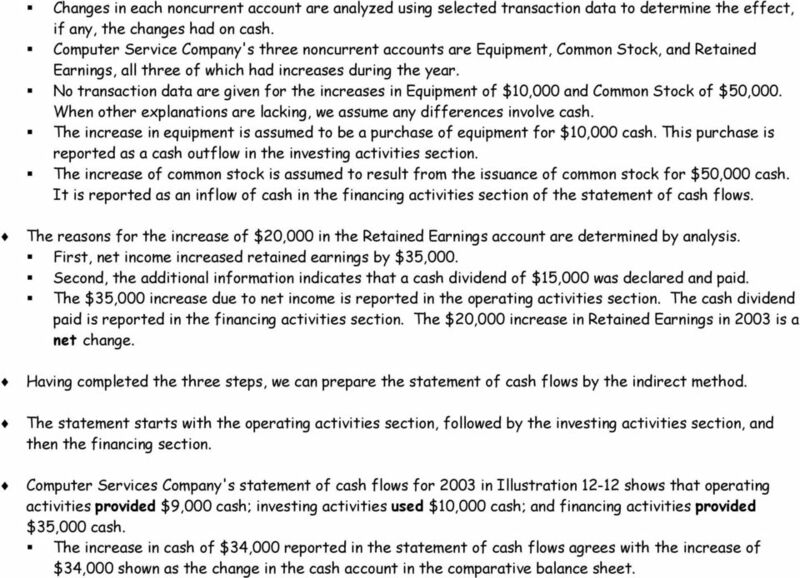 Computer Services Company's statement of cash flows for 2003 in Illustration shows that operating activities provided $9,000 cash; investing activities used $10,000 cash; and financing activities provided $35,000 cash. The increase in cash of $34,000 reported in the statement of cash flows agrees with the increase of $34,000 shown as the change in the cash account in the comparative balance sheet. 10 Information related to the second year of operations for Computer Services Company is as follows: COMPUTER SERVICES COMPANY Comparative Balance Sheet December 31 Assets Increase/Decrease Cash $ 56,000 $ 34,000 $ 22,000 increase A/R 20,000 30,000 10,000 decrease Prepaid expense 4, ,000 increase Land 1 30, ,000 increase Building 160, ,000 increase A/D--building (11,000) -0-11,000 increase Equipment 27,000 10,000 17,000 increase A/D equipment (3,000) -0-3,000 increase Total $ 383,000 $ 74,000 Liabilities and stockholders' equity A/P $ 59,000 $ 4,000 $ 55,000 increase Bonds payable 130, ,000 increase Common stock 50,000 50, RE 144,000 20, ,000 increase Total $ 383,000 $ 74,000 COMPUTER SERVICES COMPANY Income Statement For the Year Ended December 31, 2004 Revenues $507,000 Op exp (excluding depreciation) $261,000 Depreciation expense 15,000 Loss on sale of equipment 3, ,000 Income from operations 228,000 Income tax expense 89,000 Net income $139,000 Again, it is essential to determine if the net income is included in the RE number on the balance sheet. It is apparent that it is ($139,000 NI - $15,000 Dividend = the $124,000 change in RE. Therefore, use the RE-BOY number of $20,000. Additional Information: (a) In 2004 the company declared and paid a $15,000 cash dividend. (b) The company obtained land through the issuance of $130,000 of long-term bonds. (c) An office building costing $160,000 was purchased for cash; equipment costing $25,000 was also purchased for cash. (d) During 2004 the company sold equipment with a book value of $7,000 (cost $8,000 less accumulated depreciation $1,000) for $4,000 cash. 11 Computer Services 12/31/04 Instructions: 1 Input account names in designated green cells below: Input account balances in designated yellow cells 2 below: 3 Enter adjustment required by "Other Data" 4 Enter last years post closing trial balance numbers Balance Balance TB TB 12/31/04 1/1/04 12/31/04 Change Unadjusted Post Adjusted for Accounts Balance Closing EOY Worksheet CA1 Cash 56,000 34,000 56,000 22,000 CA2 Acct/Rec 20,000 30,000 20,000 (10,000) CA3 Prepaid Exp 4,000 4,000 4,000 NCA1 Land 130, , ,000 NCA2 Building 160, , ,000 NCA3 A/D-NCA2 (11,000) (11,000) (11,000) NCA4 Equipment 27,000 10,000 27,000 17,000 NCA5 A/D-NCA4 (3,000) (3,000) (3,000) Total Assets: 383,000 74,000 CL1 A/P (59,000) (4,000) (59,000) (55,000) CL2 Bonds Pay (130,000) (130,000) (130,000) SHE CS CS (50,000) (50,000) (50,000) 0 PIC PIC 0 0 RE RE (BOY) (20,000) (20,000) (20,000) 0 CashDiv Cash Div 15,000 15,000 15,000 REV 1 Revenue (507,000) (507,000) (507,000) 2 Other Rev COS OpExp 261, , ,000 5 S&A Exp Dep Exp 15,000 15,000 15,000 7 Int Exp Tax Expense 89,000 89,000 89, G/LSaleNCA 3,000 3,000 3,000 Total Liabilities & SHE (383,000) Balance 0 74, On the following page you will find the worksheet and the statement of cash flows for year 2 on the indirect method. 13 Below is the text method of determining the statement of cash flows for year 2 using the indirect method. Step 1 Determining the net increase/decrease in cash. Cash increased $22,000 ($56,000-$34,000). Step 2 Determining net cash provided/used by operating activities. Net income on an accrual basis must be adjusted to arrive at net cash provided/used by operating activities. 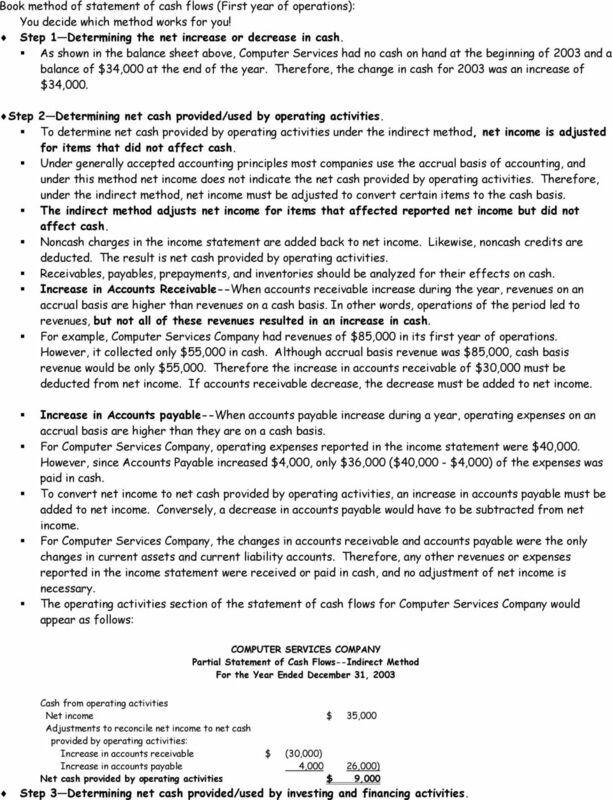 Explanations for the adjustments to net income for Computer Services Company in 2004 are as follows: Decrease in Accounts Receivable--Accounts receivable decreases during the period because cash receipts are higher than revenues reported on an accrual basis. The decrease of $10,000 must be added to net income. Increase in Prepaid Expenses--Prepaid expenses increase during a period because cash paid for expenses is greater than expenses reported on an accrual basis. Cash payments have been made in the current period, but expenses (as charges to the income statement) have been deferred to future periods. -To convert net income to net cash provided by operating activities, the increase of $4,000 in prepaid expenses must be deducted from net income. -If prepaid expenses decreased, net income would be increased by the amount of the decrease. Increase in Accounts Payable--Like the increase in 2003, the 2004 increase of $55,000 in accounts payable must be added to net income to convert to net cash provided by operating activities. Depreciation expense--during 2004 Computer Services Company reported depreciation expense of $15,000. An analysis of the accumulated depreciation accounts reveals that $11,000 related to the building and $4,000 related to the equipment. -Depreciation expense is a noncash charge, thus it is added back to net income in order to arrive at net cash provided by operating activities. -Other charges to expense that do not require the use of cash, such as the amortization of intangible assets, are treated in the same manner as depreciation. Loss on Sale of Equipment--Computer Services Company reported a $3,000 loss on the sale of equipment (book value $7,000 less cash proceeds $4,000). The loss reduced net income but did not reduce cash. Thus, the $3,000 loss is added to net income in determining net cash provided by operating activities. As a result of the previous adjustments, net cash provided by operating activities is $218,000. Step 3 Determining net cash provided/used by investing and financing activities. After determining the net cash provided by operating activities, the remaining changes in balance sheet accounts must be analyzed in order to determine net cash provided/used by investing and financing activities. Increase in Building--An office building was acquired using cash of $160,000. This transaction is a cash outflow reported in the investing activities section. Increase in Land--Land of $130,000 was purchased through the issuance of long-term bonds. Although the exchange of bonds payable for land has no effect on cash, it is a significant noncash investing and financing activity that must be disclosed. Increase in Equipment--The equipment account increased $17,000. The additional information provided reveals that this was a net increase resulting from two transactions (1) a purchase of equipment for $25,000 and (2) sale of equipment costing $8,000 for $4,000. The purchase of equipment should be shown as a $25,000 outflow of cash and the sale of equipment should be shown as a cash inflow of $4,000. Increase in Bonds Payable--The bonds payable account increased by $130,000. As indicated earlier the issuance of bonds for land is a noncash transaction reported in a separate schedule at the bottom of the statement of cash flows. Increase in Retained Earnings--Retained Earnings increased by $124,000. The increase is a net of (1) Net income of $139,000 that increased Retained Earnings and (2) Dividends of $15,000 that decreased Retained earnings. - Net income is converted to net cash provided by operations. -Payment of the dividend is a cash outflow that is reported as a financing activity. 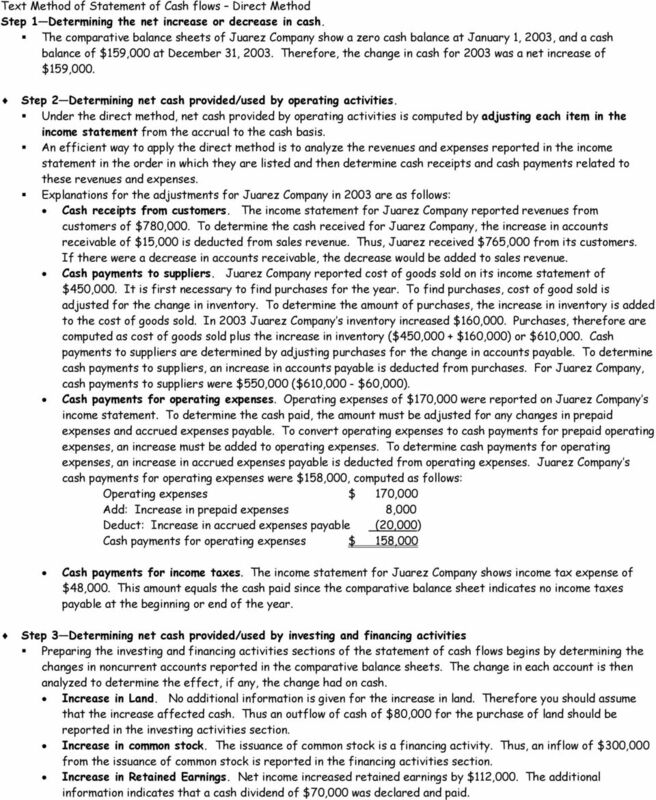 14 In summary, the statement of cash flows prepared by the indirect method starts with net income. It then adds or deducts items not affecting cash, to arrive at net cash provided by operating activities. The additions and deductions consist of (1) changes in specific current assets and current liabilities and (2) noncash charges reported in the income statement. 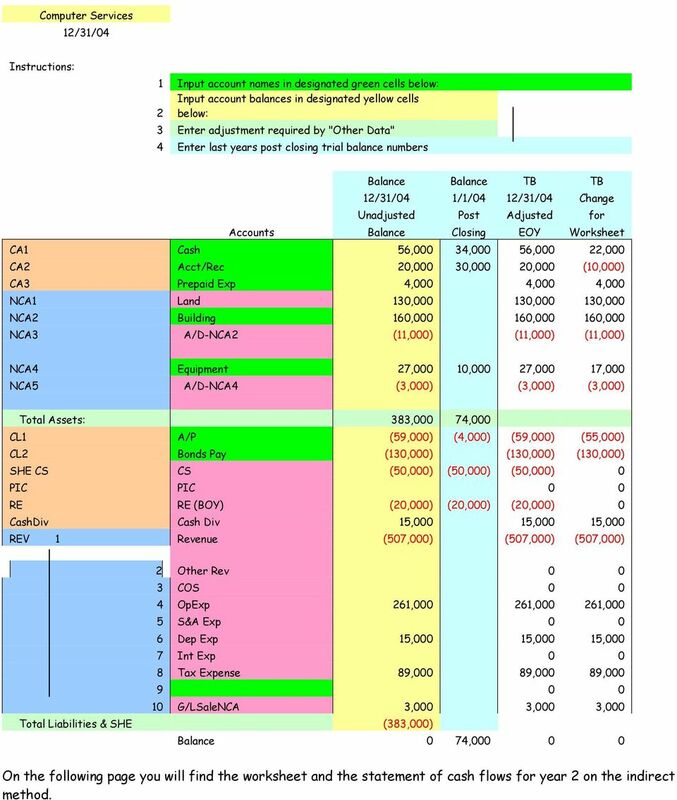 A summary of the adjustments for current assets and current liabilities is provided in Illustration Study Objective 5b - Prepare a Statement of Cash Flows Using the Direct Method To illustrate the direct method, we use the transactions of Juarez Company for two years, 2003 and 2004, to prepare annual statements of cash flow. Juarez Company began business on January 1, 2003, when it issued 300,000 shares of $1 par value common stock for $300,000 cash. The company rented office and sales space along with equipment. The comparative balance sheets at the beginning and end of 2003, and the changes in each account are shown below: JUAREZ COMPANY Comparative Balance Sheet Assets Dec. 31, 2003 Jan 1, 2003 Increase/Decrease Cash $ 159,000 $ -0- $ 159,000 increase A/R 15, ,000 increase Inventory 160, ,000 increase Prepaid exp 8, ,000 increase Land 80, ,000 increase Total $ 422,000 $ -0- Liabilities and stockholders' equity A/P $ 60,000 $ -0- $ 60,000 increase Accrd exp payable 20, ,000 increase Common stock 300, ,000 increase RE 42, ,000 increase Total $ 422,000 $ -0- JUAREZ COMPANY Income Statement For the Year Ended December 31, 2003 Revenues from sales $780,000 Cost of goods sold 450,000 Gross profit 330,000 Operating expenses 170,000 Income before income taxes 160,000 Income tax expense 48,000 Net income $112,000 Additional Information: (a) Dividends of $70,000 were declared and paid in cash. (b) The accounts payable increase resulted from the purchase of merchandise. 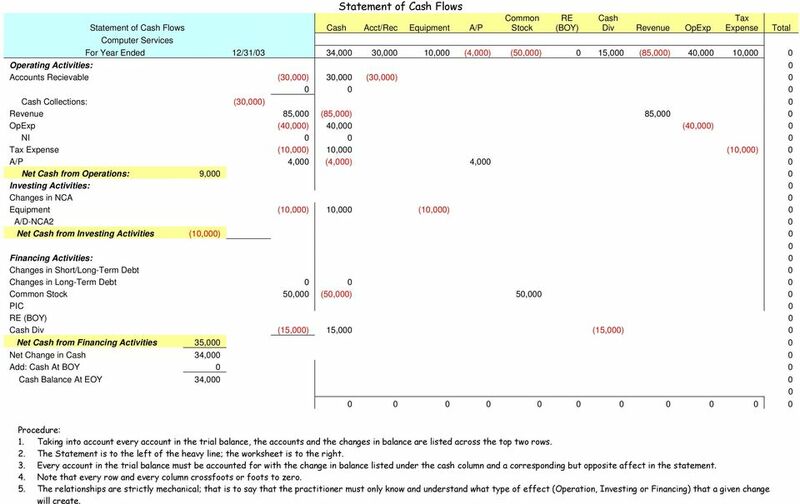 17 Text Method of Statement of Cash flows Direct Method Step 1 Determining the net increase or decrease in cash. The comparative balance sheets of Juarez Company show a zero cash balance at January 1, 2003, and a cash balance of $159,000 at December 31, Therefore, the change in cash for 2003 was a net increase of $159,000. Step 2 Determining net cash provided/used by operating activities. 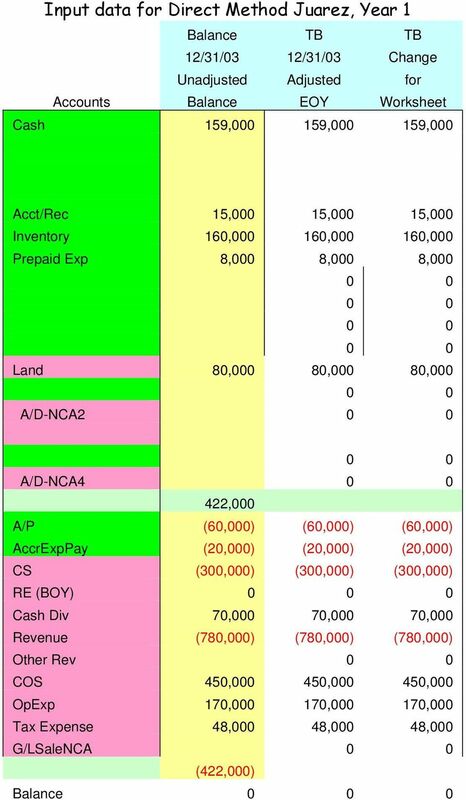 Under the direct method, net cash provided by operating activities is computed by adjusting each item in the income statement from the accrual to the cash basis. An efficient way to apply the direct method is to analyze the revenues and expenses reported in the income statement in the order in which they are listed and then determine cash receipts and cash payments related to these revenues and expenses. 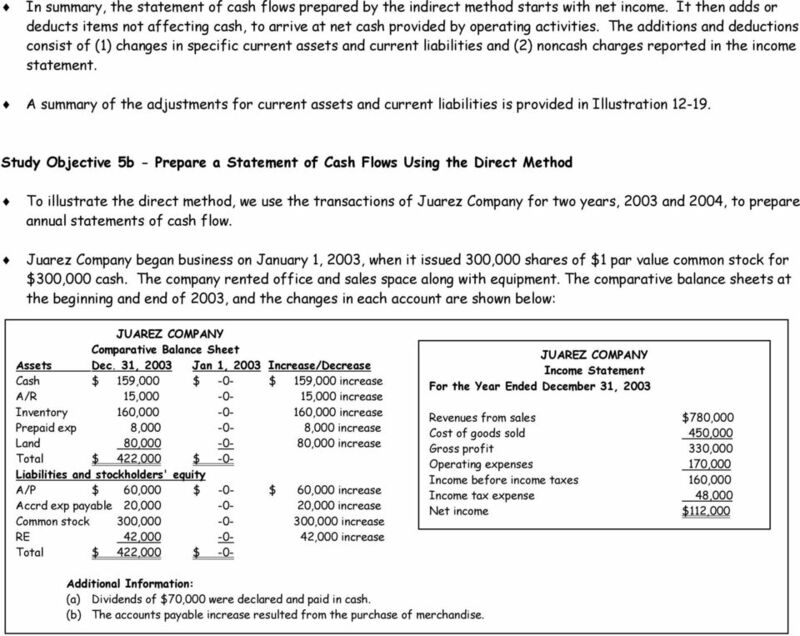 Explanations for the adjustments for Juarez Company in 2003 are as follows: Cash receipts from customers. The income statement for Juarez Company reported revenues from customers of $780,000. To determine the cash received for Juarez Company, the increase in accounts receivable of $15,000 is deducted from sales revenue. Thus, Juarez received $765,000 from its customers. If there were a decrease in accounts receivable, the decrease would be added to sales revenue. Cash payments to suppliers. Juarez Company reported cost of goods sold on its income statement of $450,000. It is first necessary to find purchases for the year. To find purchases, cost of good sold is adjusted for the change in inventory. To determine the amount of purchases, the increase in inventory is added to the cost of goods sold. In 2003 Juarez Company s inventory increased $160,000. Purchases, therefore are computed as cost of goods sold plus the increase in inventory ($450,000 + $160,000) or $610,000. Cash payments to suppliers are determined by adjusting purchases for the change in accounts payable. To determine cash payments to suppliers, an increase in accounts payable is deducted from purchases. For Juarez Company, cash payments to suppliers were $550,000 ($610,000 - $60,000). Cash payments for operating expenses. Operating expenses of $170,000 were reported on Juarez Company s income statement. To determine the cash paid, the amount must be adjusted for any changes in prepaid expenses and accrued expenses payable. To convert operating expenses to cash payments for prepaid operating expenses, an increase must be added to operating expenses. To determine cash payments for operating expenses, an increase in accrued expenses payable is deducted from operating expenses. Juarez Company s cash payments for operating expenses were $158,000, computed as follows: Operating expenses $ 170,000 Add: Increase in prepaid expenses 8,000 Deduct: Increase in accrued expenses payable (20,000) Cash payments for operating expenses $ 158,000 Cash payments for income taxes. The income statement for Juarez Company shows income tax expense of $48,000. This amount equals the cash paid since the comparative balance sheet indicates no income taxes payable at the beginning or end of the year. Step 3 Determining net cash provided/used by investing and financing activities Preparing the investing and financing activities sections of the statement of cash flows begins by determining the changes in noncurrent accounts reported in the comparative balance sheets. The change in each account is then analyzed to determine the effect, if any, the change had on cash. Increase in Land. No additional information is given for the increase in land. Therefore you should assume that the increase affected cash. Thus an outflow of cash of $80,000 for the purchase of land should be reported in the investing activities section. Increase in common stock. The issuance of common stock is a financing activity. Thus, an inflow of $300,000 from the issuance of common stock is reported in the financing activities section. Increase in Retained Earnings. Net income increased retained earnings by $112,000. The additional information indicates that a cash dividend of $70,000 was declared and paid. 22 the statement of cash flows under the direct method. Cash dividends paid are reported in the financing activities section as an outflow of cash. 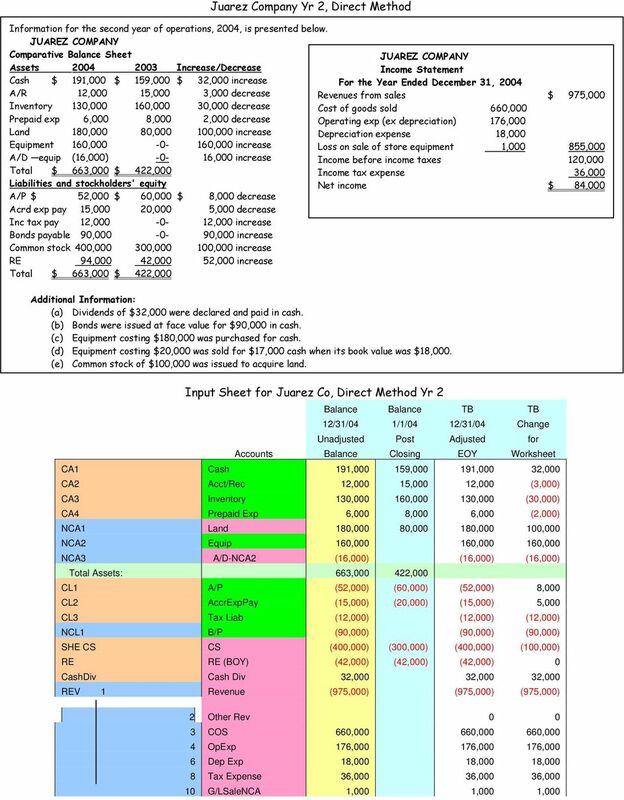 The statement of cash flows for Juarez Company is shown in Illustration of the textbook. 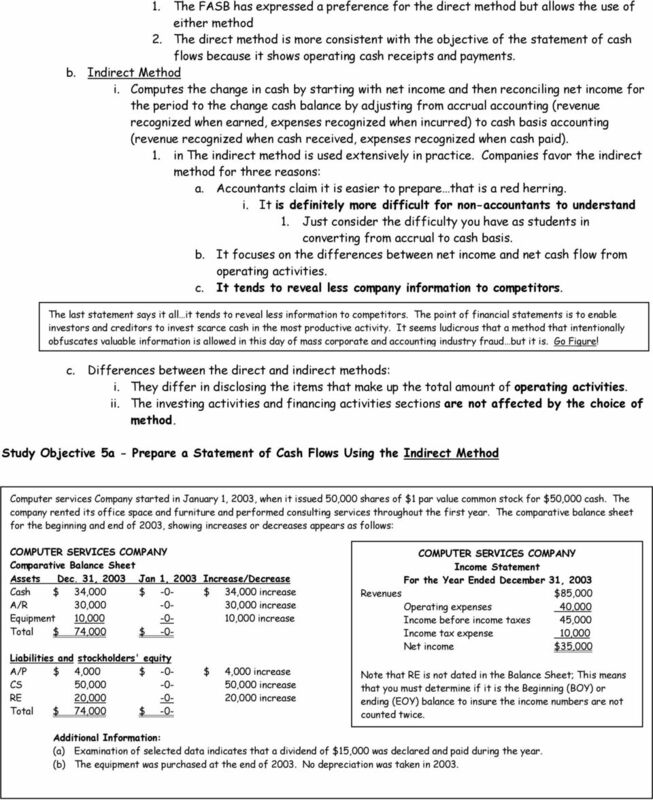 Study Objective 6 - Use the Statement of Cash Flows to Evaluate a Company 1. Traditionally, the ratios most commonly used by investors and creditors have been based on accrual accounting. a. We have been introduced to some cash-based ratios that are gaining increased acceptance among analysts. In this section we review some of those measures as well as introduce new measures. 2. Free Cash Flow--In the statement of cash flows, cash from operations is intended to indicate the cash-generating capability of the company. a. However, that cash provided by operating activities fails to take into account that a company must invest in new fixed assets just to maintain its current level of operations and it must at least maintain dividends at current levels to satisfy investors. 1. Free cash flow is the term used to describe the cash left from operations after adjustment for capital expenditures and dividends. 1. For example, suppose that MPC produced and sold 10,000 personal computers this year. It reported $100,000 cash provided by operating activities. In order to maintain production at 10,000 computers, MPC invested $15,000 in equipment. It chose to pay $5,000 in dividends. Its free cash flow was $80,000 ($100,000 - $15,000 - $5,000). 3. 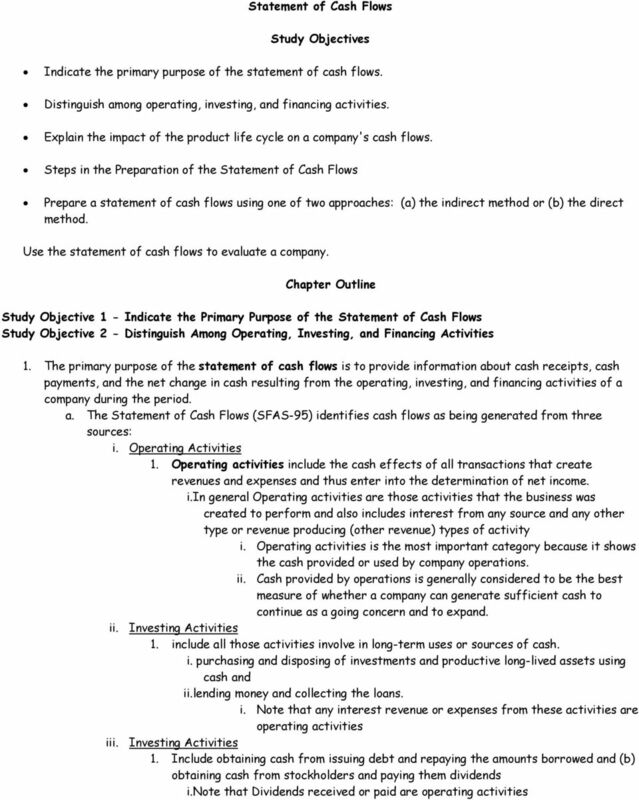 Assessing Liquidity, Solvency, and Profitability Using Cash Flows a. In this chapter ratios that are cash-based rather than accrual-based are used for the first time. 1. Rather than using numbers from the income statement, these ratios use numbers from the statement of cash flows. 2. Many analysts are critical of accrual-based numbers because they feel that the adjustment process allows too much management discretion. 1. One disadvantage to the cash-based measures is that, unlike the more commonly employed accrual-based measures, there are no readily available published industry averages for comparison. 3. 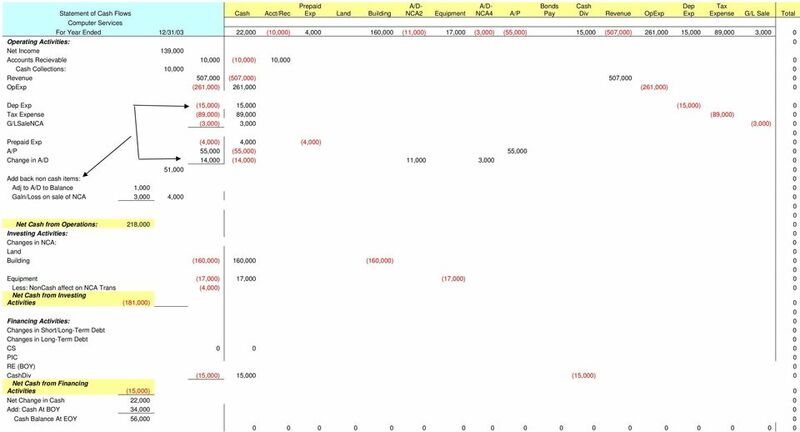 In computing cash flow-based ratios to analyze Microsoft, the following information is needed in addition to the cash flow information provided in Illustration of Kimmel 3 rd ed : ($ in millions) Current liabilities $ 11,132 $ 9,755 Total liabilities 11,968 10,782 Sales 25,296 22, We know that Liquidity is the ability of a business to meet its immediate obligations. a. Earlier, we learned that one measure of liquidity is the current ratio. Current ratio is computed by dividing current assets by current liabilities. b. A disadvantage of the current ratio is that it uses year-end balances of current assets and current liabilities, which may not be representative of a company's position during most of the year. i. A ratio that partially corrects this problem is the current cash debt coverage ratio, computed by dividing cash provided from operating activities by average current liabilities. ii. Because cash from operations involves the entire year rather than a balance at one point in time, it is often considered a better representation of liquidity on the average day.